Two stage snow blowers are designed to clear a lot of snow fast, and they have a well deserved reputation for being some of the biggest, toughest machines on the market. A two stage snow blower will often have a clearance width that can deal with a big area in just a few passes, and these machines have the kind of intake height you need if you live in a region that gets a lot of snowfall every winter. Since you are purchasing this machine for long-term use – after all, winter isn’t going to stop coming around every year – it makes a lot of sense to invest in a two stage snow blower that is one of the very best you can find. The Husqvarna 12527HV is just that kind of snow blower. It has a very wide auger, high intake, and is built to handle the deepest drifts with ease. The Husqvarna 12527HV is the kind of massive, powerful snow blower that is going to have you saying, “let it snow!” This snow blower is designed to quickly clear a wide swath, and it has the kind of extremely high snow cut depth that will allow you to always be prepared for whatever amount of snow fall winter might bring your way. And it is not just a big snow blower. It has the kind of seriously durably parts and powerful engine that means there will be no job too big for it to take care of easily. The Husqvarna 12527HV is also designed to make the job of clearing your driveway as easy as possible. Like a lot of two stage snow blowers, this one also has a rear wheel drive propulsion system. But it goes one step farther by providing power steering as well. You will have no trouble maneuvering the Husqvarna 12527HV around your property, because it truly does all of the work for you. In no time, you will have your driveway and sidewalks clear of even the deepest snow fall, and be back indoors, warming up and looking forward to the next time you will get to use it. The Husqvarna 12527HV is a gas two stage snow blower that weighs 238 pounds and has dimensions of 52 x 27.5 x 42 inches. It’s a big snow blower – and that is because it has a powerful engine supporting one of the widest clearances and highest snow cut depths you can find on a residential snow blower. And the Husqvarna 12527HV isn’t just big and powerful. It has a lot of thoughtful design details, like the LED headlight, huge wheels with deep treads, and power steering. It can throw snow up to 35 feet, which is about as far as it gets. And it comes with a 2 year warranty. The Husqvarna 12527HV practically seethes power and ability, and once you have it in your garage you will see why. This is a snow blower that is designed to take care of just about anything that even the worst Arctic snow fronts can bring on. And it is made to do it not only quickly and efficiently, but while needing as little effort on your part as possible. The Husqvarna 12527HV has the kind of outstanding design features that other two stage snow blowers typically just do not provide. It’s not just a powerful workhorse. This is truly a high performance snow blower. The Husqvarna 12527HV has a clearance that is wider than 90% of other residential snow blowers, and its snow cut depth is also one of the highest ones you can find. That means that no matter how big your driveway is, or how much snow you tend to get over the winter, the Husqvarna 12527HV will have no problem taking care of it in just a few passes. All of that clearance power is backed up by a robust engine, and the propulsion system is driven by a chain transmission, so it will have no problem dealing with inclines or uneven ground. The Husqvarna 12527HV is designed to make your job as easy as possible. It has the kind of outstanding design notes like power steering, and LED headlight so you can see where you’re going on dark mornings, and wheels that provide the kind of traction you need to take care of slippery conditions. 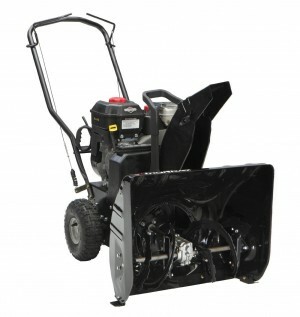 It can throw snow farther than most snow blowers, so you will never have to worry about going over the same snow more than once, and it has an electric start so it gets going right away. This is really an excellent piece of machinery. The Husqvarna 12527HV certainly has a lot to offer. This is the kind of powerful snow blower that you want in your garage when serious New England winters start dropping lots of snow on your area. Regardless of where you live, if you get a lot of snow during the winter, the Husqvarna 12527HV can take care of you all season long. And it is not just a powerful machine; it’s also very convenient and well designed. Power steering and rear wheel drive : Rear wheel drive is fairly standard on two stage snow blowers: these machines are so heavy that without it, they would be too difficult to maneuver around the driveway. But the Husqvarna 12527HV doesn’t only have rear wheel drive, it also has power steering, which makes it pretty unique. That means that using it will be almost as easy as driving a car – you won’t have to struggle to turn corners, because it does all the work for you. Massive clearance width and intake height : This is what you want on a two stage snow blower: the ability to clear as much snow as possible in the shortest amount of time. So why not try to find the machine that has the highest clearance width and snow cut depth that you can? The Husqvarna 12527HV has a clearance width that will allow you to clear a sidewalk in a single pass, and its intake height is one of the tallest out there. Durable parts that last : A two stage snow blower is going to have to stand up to tough conditions over the long term: this is a machine that you want working for you for ten years or more. So it is very important to make sure that it has tough, durable parts that won’t break down. The Husqvarna 12527HV is made of stamped steel on the body and has a welded steel auger. It will have no trouble holding up. Attention to detail : The attention to detail is where the Husqvarna 12527HV really shines. It has great design notes, like the convenient LED headlight so you can see what you are doing even when it’s dark out. Its wheels and huge, and have deep treads for better traction on slippery surfaces. It has an electric push button start so you will not be wrestling with a starter cord on cold mornings. These are the kind of things that make good products great. Serious snow clearing ability : The Husqvarna 12527HV does not just have a wide clearance and high intake that allow it to get through a lot of snow fast. It also has the ability to throw that snow up to 35 feet away, which means you will be able to clear large areas faster than ever. This machine can make short work of clearing even the biggest driveways, because you will never have to worry about going over the same snow twice. It is frankly hard to think of what more you could ask for on a gas two stage snow blower like the Husqvarna 12527HV – it really seems to have it all. Plenty of snow blowers are big and tough, but the Husqvarna 12527HV takes everything up a notch when you consider that it isn’t just one of the biggest snow blowers out there; it also has the attention to detail that makes it one of the best. There are a few areas, however, in which the Husqvarna 12527HV could be slightly improved. This isn’t possible for all of these Cons, as some of them are just the product of owning a gas powered, robust machine. And frankly, the areas in which the Husqvarna 12527HV could use improvement are minor, and they do not get in the way of its serious snow clearing prowess and reliability. But let’s take a look all the same. It’s large and heavy : When you are getting a big two stage snow blower with the kind of clearance that the Husqvarna 12527HV provides, it is going to be big and heavy. While this may present some challenges as far as getting it into your garage is concerned, the fact that it weighs so much should not be much of a problem. That’s because the power steering and rear wheel drive do all the work of maneuvering it for you. Engine is made in-house : Husqvarna is the maker of the engine on this model, which is not necessarily a bad thing, since it will be well-integrated into the machine as a whole. And I have never heard anything bad about Husqvarna engines. But it may make it a bit difficult to find replacement parts for this engine. That would not be the case if it were made by a more commonly used manufacturer like Honda or Briggs & Stratton. Produces a lot of emissions : Overhead valve engines always produce a lot of emissions, which is part of the reason they are able to provide so much power in a limited space. This isn’t a Con so much as it is a fact of life when you are dealing with this kind of machine. One drawback to this is that the Husqvarna 12527HV is not compliant with CARB emissions standards, which means it won’t be available in California or several other states. Won’t throw wet snow the full distance : While the Husqvarna 12527HV is able to throw light, powdery snow a full fifteen yards, it will probably struggle with wetter, slushy snow. That is typically true for any snow blower, though, and it is not reason to worry. But it is important to understand that the snow quality is going to affect the machine’s performance. Unlike lots of other snow blowers, though, the Husqvarna 12527HV can still throw wet snow about 20 feet, which is impressive. Controls are a bit unwieldy : The driver controls on the Husqvarna 12527HV are the only area I found that really could have used a bit of improvement. They are quite big, and since you have to squeeze the choke to operate the snow blower and get it going, if you do not have fairly big hands, it will be a bit of a challenge at first. At the same time, most users will get used to this pretty quickly. As I am sure you will agree, none of these Cons takes away from everything the Husqvarna 12527HV is able to offer in terms of power and performance one bit, and I almost would not consider several of them to be true Cons in the real sense of the word. Most of these are either common to two stage snow blowers, or else minor enough to be overlooked. All in all, the Husqvarna 12527HV remains a great snow blower. So, now that we have seen everything the Husqvarna 12527HV has to offer, the best thing to do would be to compare it to other snow blowers in its size class and price range. That is really the only way to truly know if a particular snow blower is really the best one on the market: you have to do some comparison shopping to see just how well it stacks up to the competition. Let’s take a look. As you can see, the Husqvarna 12527HV has the widest clearance and highest snow cut depth of the three snow blowers, has the largest wheels, and the most powerful engine. But not only that – it is also the only one of the three to offer power steering, have convenient design details like the LED headlight, and offer the kind of serious snow clearing ability that you can really depend on. Of the three, it’s the best. If you are serious about keeping heavy snow fall off your driveway, you need a snow blower that is designed to be serious. I think that another brief look at the Pros and Cons that the Husqvarna 12527HV has to offer should really go to show that this snow blower is for real. Power steering and rear wheel drive. Massive clearance width and intake height. It isn’t just the massive clearance and intake height that make the Husqvarna 12527HV such an impressive snow blower. It is really designed to be as convenient to operate as possible, which is why it has great features like power steering and excellent attention to detail. These are the kinds of Pros you want on your machine. Produces a lot of emissions. Won’t throw wet snow the full distance. Controls are a bit unwieldy. And none of the Cons that the Husqvarna 12527HV presents are the kind of serious drawbacks that could take away at all from the great Pros. On the contrary – most of these are either par for the course on a big two stage snow blower, or not really of major concern. A two stage snow blower like the Husqvarna 12527HV is the kind of machine you can really depend on, and when winter starts doing its thing, it is what you want in the garage. You do not want to be caught with a small, low performance machine that will not be able to get the job done in the event of a serious snow storm. But it isn’t just its size and ability that makes the Husqvarna 12527HV so special. It also has plenty of extra features that even a lot of two stage snow blowers do not bother to offer. How often do you see power steering on a snow blower? That, along with plenty of other outstanding details, is what makes the Husqvarna 12527HV one of the very best two stage snow blowers on the market today. It has the kind of excellence and reliability that truly make it a high performance machine. Now, the Husqvarna 12527HV does have a price tag that is above average for a two stage snow blower. There is no getting around that – but there is also no getting around the fact that you always get what you pay for. With Husqvarna 12527HV, you are getting a heck of a lot, too: not only does this snow blower have the kind of outstanding snow clearance capacity you need in deep winters, it offers much more as well. It is well made, and designed with the utmost convenience in mind. This is one case in which spending a bit more will really pay off in the long run.